Thursday night hike to the University Beacon with Bill, Norman and Josh. 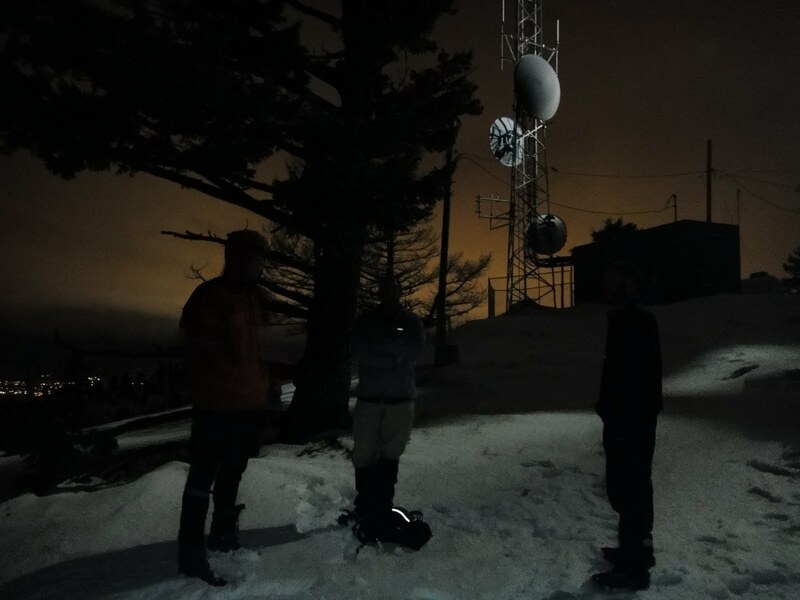 We slogged through slush, climbed up the wind-blasted ridge and made futile efforts to balance on the wind crust as tiny shards of ice whipped up around us. During the descent, Bill accidentally stepped off a snow shelf and hyperextended his knee. Suddenly, a simple Thursday night hike became a half-rescue effort. With no police officers in sight, we had to fashion walking aids out of sticks and walk with a pain-stricken Bill as he picked his way down the mountain. At the slower pace, sweat and fingers started to freeze. A reminder that even casual outings have a sharp edge during the winter. Friday on a jet coasting over the Pacific Ocean for hours, too many hours, landing in the strange and alien land of O'ahu. Beat, being the jet-setting ultrarunner that he is, was signed up for the HURT 100 and let me tag along for a regrettably short weekend trip in Hawaii. I am here to serve the role as crew/pacer. We were up at 4 a.m. to get to the race start. I saw him off in the inky blackness of a low-latitude dawn, and now I'm prepping to spend the day shuttling between checkpoints to help with the race. After 12 or so hours of wending through Honolulu traffic and subsisting on bagels and coffee, I'm going take a quick evening nap if I can manage, then don my own running gear and - if all goes well - join Beat on lap 4. That's at least 20 miles of muddy technical running in heat (at least relative to what I'm used to, 75-80 degrees) and humidity, beginning after midnight and continuing into another inky black dawn. 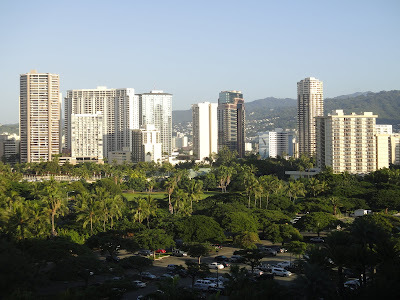 As I sleepily make my way through Waikiki, I see people sprawled on beach chairs, swimming in clear warm water and bobbing in the gentle surf beneath blue skies. I recognize these scenes as opportunities that I'm squandering, but I no longer view it that way. One of the best parts of getting older has been a real acceptance that I'm not a product of the images and culture I was fed throughout my youth. I don't have to aspire to an MTV bikini body and an idle life of leisure with a glut of useless consumer products. I can travel all the way to Hawaii for three measly days to stay up all night, eat crappy race food and run technical trails in the mud and rain, and maybe not even touch a grain of white beach sand, and not feel bad about it. In fact, I feel pretty good about it. This is my vacation in paradise, and I'm going to live it up. The way your life has changed in the past year simply amazes me Jill. I can hardly keep up with all the goings on. The best part? It comes across that you are happier than you've ever been. "One of the best parts of getting older has been a real acceptance that I'm not a product of the images and culture I was fed throughout my youth. I don't have to aspire to an MTV bikini body and an idle life of leisure with a glut of useless consumer products." - thumbs up to that Jill, I couldn't agree more. By the way in your past winter riding experiences when the wind has been blowing hard, its snowing, its cold; have you donned both a balaclava/face mask and goggles? If so how was the battle with foggy goggles and did you overcome it? I have to ask for the favor of a reply. What exactly does "a glut of useless consumer products" mean? We keep narrowly missing crossing paths (not that I would've managed to run into you if we'd been in Oahu at the same time). Crazy world. 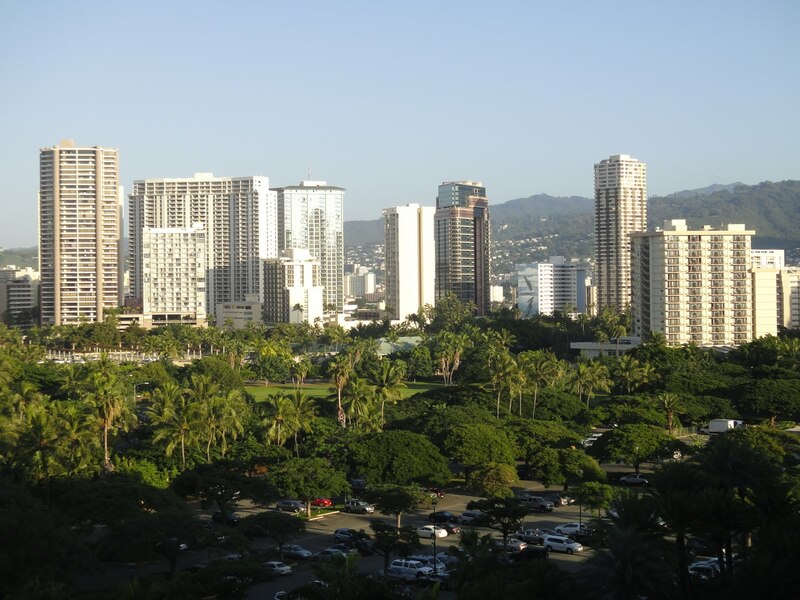 I have a feeling you're about as fond of Waikiki as I was - if you go back, there's some beautiful camping on the north shore. Wait a minute. You flew all the way to Hawaii to watch someone else compete, rented a car and drove around the crowded city eating fast food, then write a blog about it on your computer, and you think the people sitting on the beach represent a "glut of useless consumer products"? So glad you are happy and having fun, but be careful of criticizing others for the way they enjoy their fun. Agree: relish your own "life of leisure" flying around the continent for to play in the outdoors using your own "glut of consumer products" (expensive single-purpose bikes, satellite-talking GPS electronic wrist watches and heart monitors. Careful about "my type of play is holier than your type of play". Ouch. You kinda got caught out on that one. But isn't it nice to have perceptive readers to keep you honest? Actually, that's not what I meant at all. I realize my lifestyle is excessive, and often question the reasons why I enjoy the things I enjoy. I have never been preachy on my blog because one of my strongest beliefs is that every single person is an individual, and I would never expect them to value the exact same aspects of life as me, and would hope for the same courtesy. So anything you interpret as preachy is just your misreading or my miscommunication. But, you know, whatever. I really enjoyed my experience at the HURT 100. I got to see the stories unfold from both sides of the line, as a crew member and as a pacer for 27 miles of that incredibly rough course. I'm glad I came. I don't regret it at all, even if it doesn't conform to the standards of what is normal, rational or even healthy for most people. That's all this blog post was about. I have the pleasure of dog sitting for a HURT 100 pacer as we speak, it was fun to see Beat's name in the live updates. Congratulations, Beat! I'm looking forward to reading about your Hawaii experience and, as always, seeing your photos. Thanks for letting the less adventurous of us live vicariously through your travels. I would have at least gone for a swim in the ocean even if you are there to assist Beat. I can't imagine what you two get paid to be able to fly back and forth to see each other so much. You may be getting a bit older but your having more fun than those "adults" on MTV I think. On re-reading your post, I take back my comment that it was critical of others. It was not. But I only made one comment, so at least one (and I think two) individuals also misread so perhaps it was a combination of misreading and poor communications of that particular idea. No biggie, as I'm sure all of us enjoy your posts overall, otherwise we wouldn't be reading! We should all keep in mind that at least some of the MTV bikini bodies seemingly living a life of leisure on the beach may actually be hardworking people who give their all at whatever they do and are taking a much needed break - who can really know? Many people have a wilderness to travel through - it's just easier to see in some people's lives than others. You mildly goof with the "useless consumer products" comment, though. Whoops. Yes, obviously it takes money to travel around like this. Money is a sensitive issue, as evidenced by at least three people's reaction to this innocuous post. It's more difficult for me to understand just because of my own values, which place time, experience and relationships far above the worth of money, status and things. It's true I own a few nice things; bicycles and winter gear comprise the bulk of my personal "worth" - on top of a bit of savings I have been able to acquire despite a career of low-paying jobs, precisely because I don't place value on things and thus don't own much. By the way, I just spent the morning drinking coffee and lounging on a white sand beach in the sunshine, and it was wonderful. Didn't Geoff just post the same "anti-things' comment on his blog a few weeks ago? The thing is, I'm not being critical at all. I see your effort for what is-your chasing another guy. But I really admire the passion, I truly do. But just what, I ask again, are "Useless consumer products"? I own about 40 bikes, but I bought them with money I earned. When I read a comment about the current flavor of the month, i.e. bashing those who are hung up on money etc., I'm reminded of an interview I read with the late singer of an 80's band, Quiet Riot. He had made millions and was living in his mothers house, and was asked, "Do you feel bad for having wasted all that money? ", to which he replied, "NO, not all, I enjoyed spending the money". I often think to myself when I read these quotes from people that they are just frustrated they are scraping by and want others to dumb-down their lifestyle so they will feel better about what they have (haven't) done. Get some sun, have fun. Doesn't mean you have to be a 36D and have a belly button ring etc., but soak it up. But see my question above? What does that mean? "Useless consumer products" = "Stuff you don't need." I recognize this term is completely subjective. I of course own a fair share of my own UCPs. But I also feel the most free when I'm operating with the least stuff ... i.e. self-supported bicycle touring. So I try to keep my stuff supply to a minimum, and let a lot of things come and go in my life without much concern for them. If I came home one day and a burglar had completely cleaned out my house, beloved Pugsley at all, I'd feel anger and disappointment, but I'd get over it pretty quick. I know deep down I don't need any of it. You can believe me or not. I don't really care either way. I met you this weekend at HURT and have known Beat for a few years as a HURT participant. I came across your site from a photo you posted of him on FB. I hesitated to even comment because of the tone of the comments above. I don't know if you actually know these people personally or not but I find it interesting that what you wrote would cause such comments from people. In any case, I look forward to learning a bit more about your adventures and possibly reading your book. I also want to read your Tour Divide posts. Good luck to you both on your adventure up in Alaska. Maybe we will see you out on the HURT trails next year! Stuff you don't need.... Like nick-knacks? I love you, I really do, but flying here, there and everywhere, driving here, there and everywhere, and then looking down at bikini-babes, and someone who has a few seldom used things lying around...I'm not buying it, and to respond to another commenter, it is your blog, and a place for your opinion. But the difference is it's a public forum which you have chosen to put out there, not an email to a few friends. I fully support your decision to go to work at Adv Cycling, and admire your record in the Divide Race. Just be sure you are not trying to fill some void in your life with the running/riding. These are parts of a fulfilling life, not the entire life itself. Not lecturing you, just talking to a remote friend. When I first ready this post, I was somewhat struck in that it was the first time I read anything that you wrote that I would consider in any way "controversial". In re-reading the last paragraph a few times, I believe that it was just awkwardly written, despite your considerable writing ability. It does come across somewhat "snobbish", though I realize that was not the intention. Nor would a regular reader such as myself consider you that way. On the contrary, I'm sure that I'm not alone in admiring your incredible discipline and tenacity. Certainly I would not criticize a person for traveling around in search of adventure, according to their means, even if it were every weekend. The critics should re-read the posts about how you drive around in that old Geo. Never-the-less, no one should begrudge you traveling to Hawaii for a race. I'd do it if I could. Z-man ... You own 40 bicycles, and yet you are lecturing me on the importance of balance and moderation in a fulfilling life? But the story of stuff is a discussion that could go on and on. I used to believe there was something wrong with me when I did not want the things my friends wanted and didn't really care about the things I have. Now I know where my values stand and I've decided that my priorities rest in experiences. That's all life is, after all - one big experience. Thus, all of my limited resources are funneled into experiences. Thus far, I have been quite happy with my "purchases." I guess I can't convince you that I was never criticizing anyone, just asserting where my values lie. Here's the way I see it: I said "I like cats but I don't like dogs," and you took that to mean "People who like dogs are wrong." I don't see the connection. Not everyone has to like dogs, or cats for that matter. That's the beauty of individualism. As to your other criticism about chasing a guy ... um, duh. If love and adventure aren't worth pursuing in life, what exactly is? jill, i don't know you. i'm not sure how i even came across your blog, but i now read every post and feel privileged to share from afar your incredible adeventures. it is truly inspiring. so don't listen to the naysayers and critics! keep going - keep posting. my life would be that little bit dimmer without your blog. p.s. you have inspired me to enter my first ultramarathon in may. Again, I'm not being critical. And actually it's 48 bikes, and I got them in an unusual way. I bought with money I earned, and the ones that aren't in some sort of resto stage are ridden regularly. And I never thought you were being critical. Let's face it, e-mail is a lousy conveyance. I truly do not understand when someone bashes "consumerism" without an example. BTW, I'll be stopping in the AC when I pass through to say hello. Always good to put face to type. So I think I can't resist to say a few things ... there are a number of implicit assumptions being made in some of the comments which I think are not correct, and also things weren't really read carefully and people who probably had some past issues with accusations of consumerism felt attacked although this post wasn't at all about that. Modern business is about telling people what they need, because it's long been realized that real needs don't suffice to fuel the economy - so much so, it's almost become a part of western culture. In that sense it's exactly that - we NEED useless stuff, because there isn't enough useful stuff to fuel the economy. Jill is happy to be quite free of this influence, and I can attest to that. That's all she wrote, and it doesn't contain any value statement about people who do conform to this lifestyle. It's exactly the opposite - she may have used to ask herself if there's something wrong with her, and she realizes there's nothing wrong! How is that "looking down" on people? The whole paragraph was about self-realization ... read it again. And of course there's nothing wrong with having stuff you don't need that you enjoy, and no kidding that's exactly what having a bike is (to us, apart from occasional commuting duties ;)! But I know too many people who do what they think they should do and yet are unhappy - and that's a problem. It's not that they are bad people. It's that they got screwed by being told what success means and being unfulfilled by it ... or unhappy about not achieving it ... or they're lost and think WTF when they do and there's just emptiness. For some people the pursuit of money stands in the way of doing stuff they'd really be happy about. It's something I myself felt in danger of in the past (although I am lucky in that I am well compensated for pursuing my (other) hobby - writing software). And yes, of course one could debate if or not this advances civilization as a whole because it spurs innovation and could go on and on and there are pros and cons ... in the end, our society relies on conformity to a great deal, and in many ways we're as conforming as everyone else. but that's not the point of this blog post. It also seems that some of the commenters seem to think or imply that Jill is a hypocrite because it seems she's consuming a lot herself. Again though, this isn't supported by facts - but apart from that it misses the point in the first place. Jill is truly one of the least materialistic people I've ever met - in a good way, because she knows where her happiness is coming from, and money just doesn't happen to be too important for that. Btw the only reason we didn't go swim/snorkel is that swimming with open wounds just isn't really much fun, nor does it seem too safe :). You wouldn't catch us lying around on the beach for too long, but I love snorkeling and scuba diving (which is even less advisable after a long race for physiological reasons) ... because what you get to see is just so amazing (and I also like swimming :).